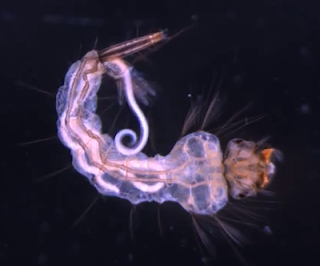 If you don't like mosquito bites, then you will like today's parasite as it is a mermithid nematode which infects mosquitoes. We have previously featured worms from that family of nematodes - they all infect arthropods as larvae but have adults that live free in the environment. The larval worm develops inside the host's body and once it is fully mature, it exits its host by drilling a hole through the body wall, killing the host in the process (you can see this in action here). Not only is Strelkovimermis spiculatus a scourge for mosquito larvae, it is also easily cultured in laboratories, and is not very picky about which species of mosquito it infects. So not surprisingly, S. spiculatus is also currently being considered as a biological control for mosquitoes. But how does S. spiculatus infect the mosquito in the first place? Mosquito larvae can live in just about any waterbodies, ranging from permanent ones such as lakes or dams, to more ephemeral bodies of water such as puddles or rainwater that collect in cavities such as car tires. Because mosquitoes can breed opportunistically in just about any pool of water, parasites that infect their larvae must also be prepared to be equally opportunistic and S. spiculatus has adaptations to do just that. Firstly, the eggs of S. spiculatus are able to survive being dried out; this allows them to simply wait in empty ponds or puddles for them to fill up and become colonised by mosquito larvae. Secondly, even in more permanent water bodies S. spiculatus eggs can stay dormant in the environment for several months. The reason is that once the parasite larvae hatch, they have a very short window of 24-48 hours to find and infect a host before they die, therefore they have evolved to hatch only if suitable hosts are available. So what is it about the presence of mosquito larvae that trigger these dormant eggs into hatching at just the right moment? To find out, a group of scientists exposed some S. spiculatus eggs to both chemicals and vibrations that are associated with mosquito larvae. They exposed S. spiculatus eggs to "mosquito-conditioned water" (which is basically water which had mosquito larvae in them for a while) as well as vibrations generated by artificial mosquito larvae that mimic the behaviour of real ones. To make these artificial mosquito larvae, they took tiny strips of iron wire and coated them in hot glue. They then placed those coated bits of wire in the assay container and rested the container on a magnetic stirring plate (common in laboratories) to make their little "artificial mosquito larvae" move. They found that while the vibrations generated by those fake mosquito larvae did not provoke the eggs into hatching, the scent of mosquito larvae in the water induced about a third of the eggs to hatch. But that was not as good as the presence of actual live mosquito larvae that send the eggs into a hatching frenzy. Furthermore, the eggs of S. spiculatus are also most likely to be set off by the presence of second-instar mosquito larvae and they trigger almost twice as many eggs into hatching than any other mosquito stages. It just so happens that mosquito larvae at this developmental stage are also the most vulnerable to infection by S. spiculatus. By having hardy eggs that can survive being dried out, remain dormant for extended periods of time, and hatch only when presented with the right signals, S. spiculatus can simply lurk in the environment, ready to launch into action whenever mosquito larvae might appear. Nematodes are commonly referred to as "roundworms" as that describes their cross-section if you were to cleave one right across its mid-section. Other names for nematodes (particularly parasitic ones) include whipworms and threadworms and this reflects their general shape. Unless you examine their anterior or posterior end really closely, most nematodes are quite... boring looking really... basically, a long thin cylinder that is tapered at both ends. So at least on a superficial level, it's a case of "seen one, seen them all" - but not the nematode we are featuring today. There is very little known about nematodes in the muspiceoid family. Once they become infective, the larvae are assumed to burrow their way out of the body of the female worm and escape to the surface of the host skin. There, they might await contact with another host. However, the larvae of muspiceid nematode have also been found inside blood-sucking ticks and insects, but it is unknown if those arthropods play a role in the parasite's transmission, or if they were simply ingested incidentally while the arthropods were taking a blood meal. Hasegawa H, Satô M, Maeda K, Murayama Y. 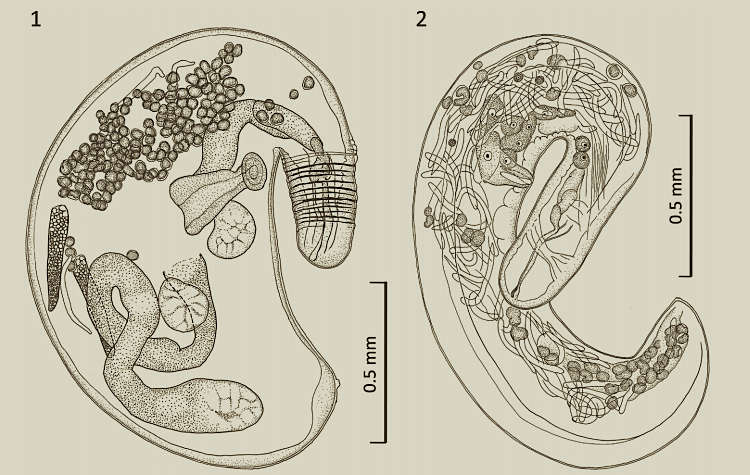 (2012) Description of Riouxgolvania kapapkamui sp. n. (Nematoda: Muspiceoidea: Muspiceidae), a peculiar intradermal parasite of bats in Hokkaido, Japan. Journal of Parasitology 98: 995-1000.